IOS XR is a train of Cisco Systems' widely deployed Inter-networking Operating System (IOS), used on their high-end carrier-grade routers such as the CRS series, 12000 series, and ASR9000 series. 1. 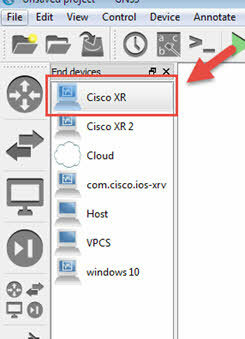 Download Cisco XR IOS image, I have download it from this link: https://upload.cisco.com/cgi-bin/swc/fileexg/main.cgi?CONTYPES=Cisco-IOS-XRv . I have downloaded the “xrvr-fullk9-4.3.2.vmdk” for this lab. 2. In second step you need to create a virtual machine from this download file. 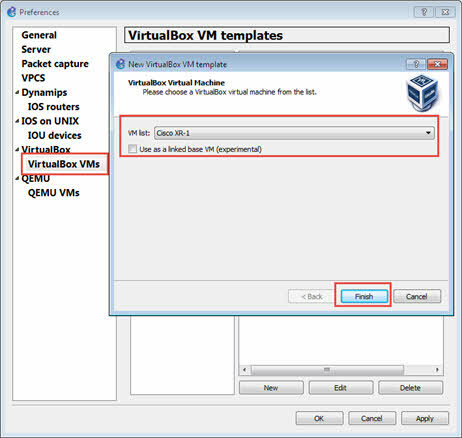 I have created a virtual Machine using Virtual-Box. 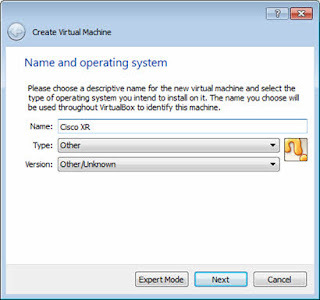 Open your Virtual Box and click on new for creating a new VM for Cisco XR image. 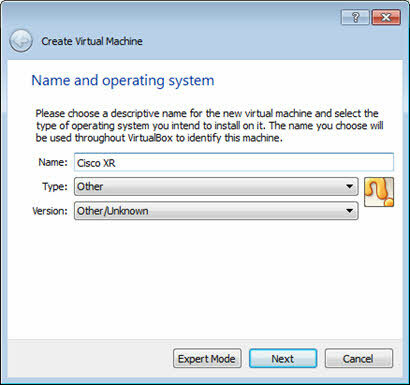 A wizard with start, in first step you are required to enter the name of Virtual Machine. 3. 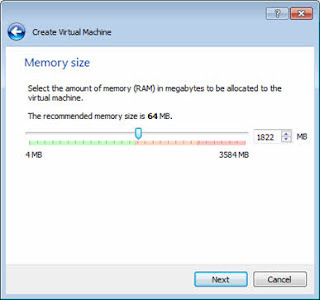 In next step you are required to allocate the RAM for your Cisco XR VM. It is recommended to allocate at least 1.55 GB RAM. 4. 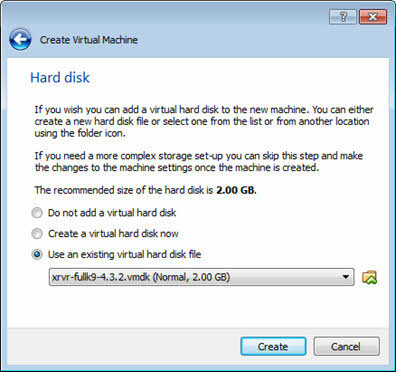 In next step you need to select the virtual hard disk for you VM. Choose the options “use an existing virtual hard disk” and browse the cisco XR image that you have download in first step. Click on create this will create a new VM in VM list. 5. Now open the GNS3 and go to edit/preferences and from virtual machines menu click on new. This will start a new wizard select VM that you have created in Virtual-box and click on finish. 6. After this you will find Cisco-XR image in GNS3 device list. Drag this image to GNS3 dashboard. 7. Start the XR IOS, once it is started, right click on device and click on Console. 8. Cisco XR image will take some time while loading. During loading it will also give you the message “this (d)rp node is not ready or active for login /configuration” you can ignore this message for a while after some time it will ask you to set username and password. 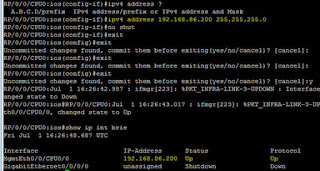 First set the username, in my case I have set it with “root” you can use any other. Then it ask for password type the password it will reconfirm from you. 9. Once you have set username and password for Cisco XR IOS image in GNS3, it will take back you to login screen. Now login with username and password that you have set in step#8. 10. Now you are in Privileged mode, type the configure terminal for global configuration mode. Now you can configure your router as per your choice. Configuring IP address on Cisco XR is a bit different as compare to other IOS. Go to global configuration mode and use the following commands for assigning IPV4 address to cisco XR image. What cisco account? NetAcad or other ? plz share user/pass to login cisco website..
Hi, do i have to pay for the downloaded software? 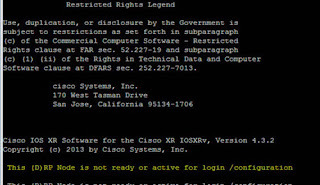 I want to share my cisco login ID & Pwd. Pls don't change the password. I need help, download the files from the cisco page, but I only run the system verification. I am not allowed to enter any command. There is a possibility that someone will give me the program "xrvr-fullk9-4.3.2.vmdk" or something similar, I urgently require it. Dear any one help me to dhare the file. I am unable to dowload the file. hi I am getting this error "RP/0/0/CPU0:Jul 31 13:27:18.093 : sam_server: %SECURITY-SAM-4-WARNING : Failed to initialize nvram digest"